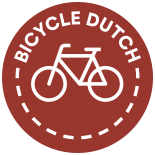 Convenience is one of the main reasons for the Dutch to cycle as much as they do. They take their bike to go shopping because it is easier, faster and more convenient than taking the car or another mode of transport. In order to get cycling this convenient you need good infrastructure, safe streets and a place to park your bicycle at that grocery store or any other end-destination. But it all begins at home! Your bicycle must be ready to use quickly and in a convenient way. If someone had to carry a heavy Dutch bicycle three floors down from an apartment, to cycle 5 minutes to the store, you can be sure that person will find an easier mode of transport to get to that shop. But in the Netherlands people mostly have their bicycles readily available and that is because building regulations make sure that most of the Dutch have a perfect place to store their bicycles in or near their home. 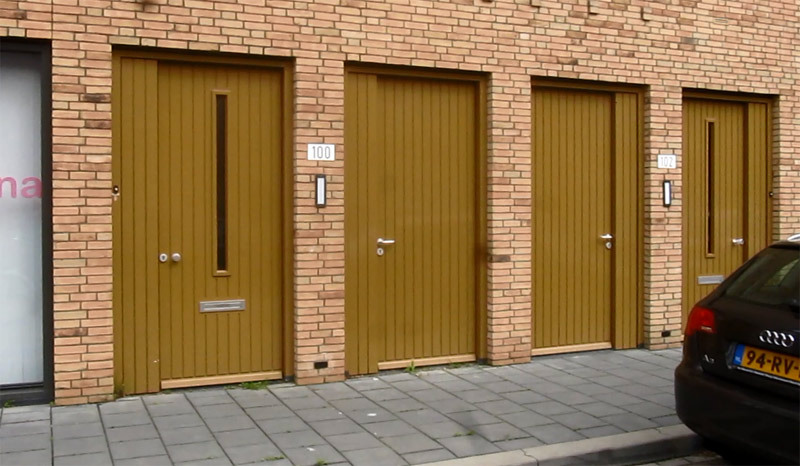 Homes, including apartments, built after circa 1950 in the Netherlands must have private bicycle storage rooms that are accessible from the public road. Homes built before 1950 do not have private bicycle parking facilities. That means that in older streets outside bicycle parking is needed. The regulations have existed since about 1950, first in municipal regulations and from 1992 as national regulations. 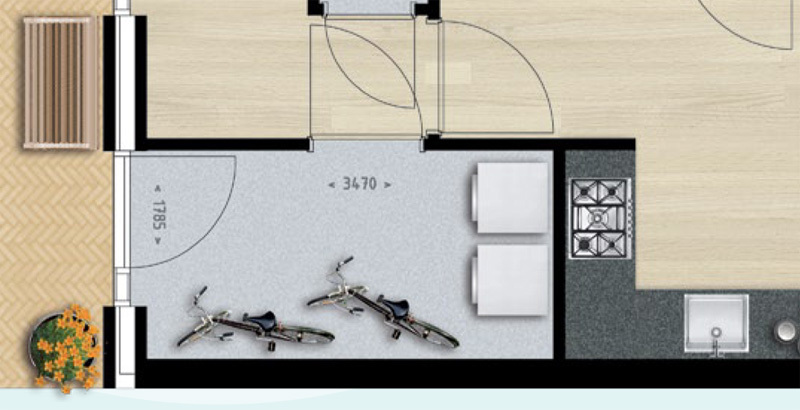 Not only do they state the specific dimensions of a bicycle storage room but, even more important, they state the storage room must have direct access to the public road. That means that if you live in a post 1950 home in the Netherlands you do not have to store your bicycle in your living quarters at a higher floor, but that you can use a room that can be reached much easier. 1. A home must have a space to store bicycles protected from the weather. 2. A home meets the requirement of paragraph 1 if the space is constructed according to the regulations in this section. 1. A building with the main function of habitat must have -as a sub-function- a private lockable storage space of at least 5 square meters with a width of at least 1.8 meters and a height over this width of at least 2.3 meters. 2. Notwithstanding paragraph 1, the storage room may be shared, when the habitat function of the dwelling does not exceed 40 square meters and the storage space for each dwelling is at least 1.5 square meters. 3. The storage room has to be directly accessible from the public road or from a shared private area that gives direct access to the public road. The external construction of a storage space as described in article 4.31 has to be rain resistant according to the regulations of NEN 2778. From 2003 the regulations were lifted from the building regulations. Developers claimed they – and the market – could decide what was best and wanted. But immediately you saw developers cut costs by striking the bicycle parking facility from especially their apartment buildings. The Fietsersbond, the Dutch Cyclists’ Union, protested right away and politicians, especially those in the larger cities, agreed fairly quickly that this was an unwanted phenomenon that also contradicted the policies to stimulate cycling. Already in 2008 the minister agreed that the bicycle storage requirements had to get back in the regulations and they were indeed finally re-instated from early 2012. Modern homes usually have the bicycle parking space indoors. These two homes have a front door and a door to the bicycle parking facility right next to it. 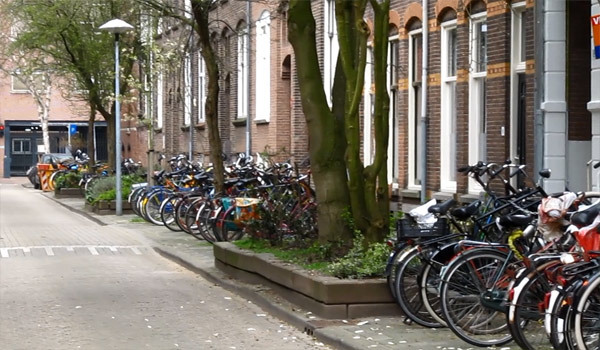 The video explains how the Dutch can park their bicycles at their homes. I think every country should take on this policy. IJdock is a fairly new development, so it should have provisions for bike parking. In Hamburg, Germany I saw these sheds that bikes are stored in. Inside is like a bunch of triangular shaped rooms with a hook at the top for each bike which is stored by hanging on it. Here someone writes about them. Very interesting information on the Dutch way of life. I’d love to see some of that type of thinking here in the states. Oh, how I wish they would scale up the minimum required storage space! My 1977 house has a small storage room at the front. It is rather too small to fit our five bicycles in (mine, the wife’s, and for our three kids). It requires pro-level puzzling skills. Usually in suburban terraced housing, the bicycle shed is accessed around the back. Mine doesn’t have a back alley, so I cannot build an extra shed in the garden either. These things are important, that’s why I’m so glad they reinstated that building code. We have storage issues for all our bikes too. Unsolved as yet but are considering some WheelyLifts http://www.wheelylift.com/. A bit more expensive but then what is the dollar value per square metre of the new space you will create in your storage room. What a great post! You’re talking about national regulations. I wonder if local government areas have their own layers of additional rules, or if the whole country sings in once voice? But thank you! Most appreciated! Well, the whole country sings the same basic tune, but every municipality does have additional voices, that can even also differ within municipalities. You’ll understand that it makes a difference if you want to develop a residential building in a historic city center or in a completly new development on the edge of a city. Municipal codes can ask for specific heights, materials, colors etc. Tailor made for the specific location. But the basic set of rules is found in the national building regulations that have been existing since 1992. There were some adjustments over time, like the changing rules for bicycle parking facilities that I describe in this post. Interestingly some municipalities required those bicycle parking facilities in their local codes at the time they were taken out of the national regulations. So these local variations are still there and derive also from the history of these regulations that started as sets of local rules in the first place. Thank you for this, another very good and highly informative blogpost. Between yours, David’s and Marc’s efforts and Pete Jordan’s book I feel like I don’t even need to visit the NL to see all this for myself. But I will anyway! 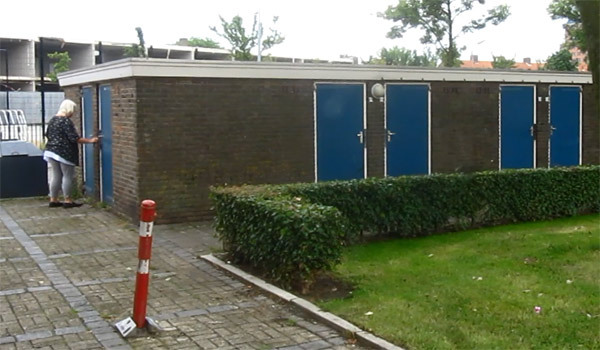 This entry was posted on 11 July 2013 by Bicycle Dutch in Original posts and tagged residential cycle parking.